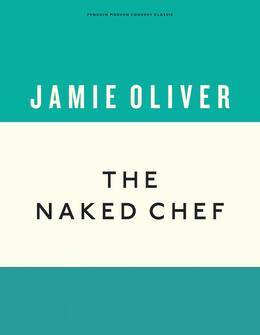 This year marks the twentieth anniversary of the publication of Jamie Oliver's first cookbook, The Naked Chef, and to celebrate, it has been rereleased as a highly collectable anniversary hardback edtion, along with Jamie's following four cookbooks, The Naked Chef Returns, Happy Days with The Naked Chef, Jamie's Kitchen and Jamie's Dinners, reminding us that there are few people who have influenced the way we cook, eat and think about food as much as Jamie Oliver. What I thought: I’ve always thought risotto gets a bit of a bad rep – frequently cited as a bland, boring, solitary vegetarian option – but in my mind, with the right recipe, it can be as fuzzy-feeling-inducing as a giant bowl of pasta. 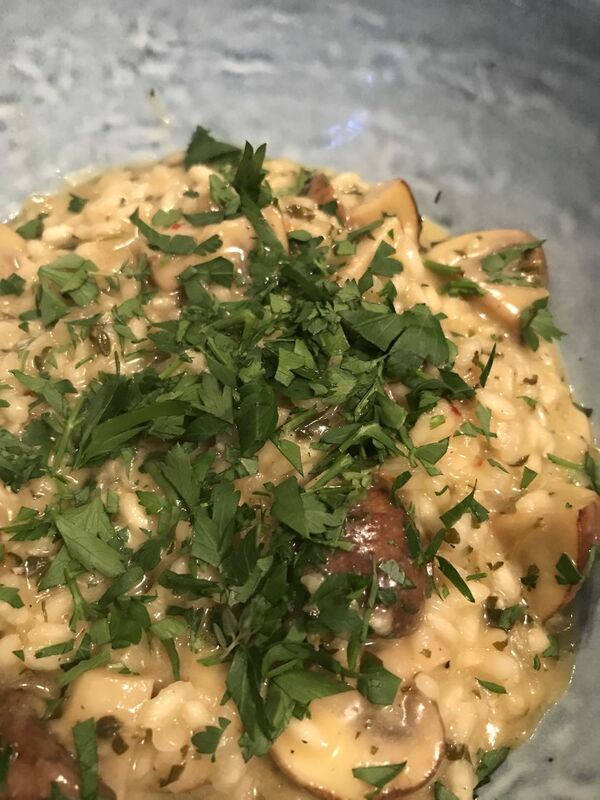 Jamie’s Mushroom Risotto from The Naked Chef is the perfect example of a solid (yet quick and easy) risotto recipe, with that comforting balance of creaminess and zestiness in one beautiful bowl. 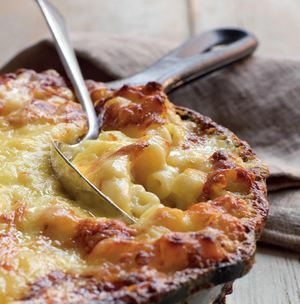 The acidity of the lemon contrasts pleasantly with the oh-so-generous helpings of parmesan and butter, somehow delivering a freshness to what is otherwise a pretty luxurious dish. I used chestnut mushrooms simply because they’re my favourite; there’s a meatiness to them that’s just as satisfying as chicken or fish, so if you’re trying out the flexitarian lifestyle, this meal has got to be in your repertoire. 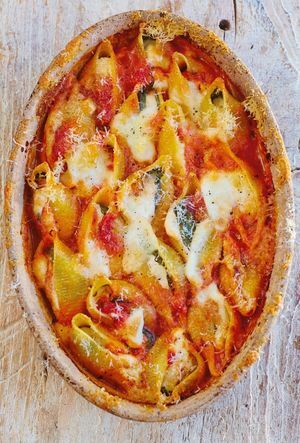 It took about 40 minutes to make – 15 minutes to prep and 25 minutes to cook – so it’s a relatively simple midweek meal you can rustle up after work. I know a lot of people who don’t like cooking risotto because of the attention it requires, standing by and gradually stirring in the stock so that the rice doesn’t boil, but it’s super satisfying to watch the flavours coming together, and the wine-meets-herbs-meets-frying-onion creates a heavenly smell that I wouldn’t want to miss out on, anyway, so just enjoy the process! 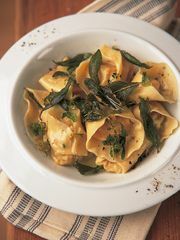 I added a little more lemon and chilli than Jamie suggests in this recipe, but that’s just personal preference, and finishing it off with a scattering of parsley makes it look that little bit fancy. Creamy. Refreshing. Simple. 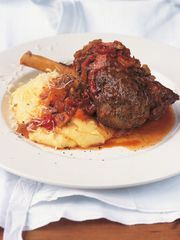 My kind of Wednesday night meal – though I’m sure it wouldn’t go amiss at a dinner party, either. What I thought: What a wonderful trip down memory lane this was for me. 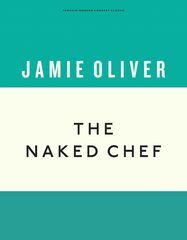 I remember being glued to the TV when Jamie burst onto our screens in the mid-90s as The Naked Chef, ready to change the British food world forever. 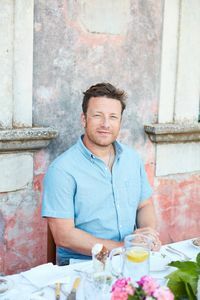 It's quite astonishing to think about how much he has achieved in the 20 years since his first cookbook was published and it feels gloriously nostalgic to revisit those early books again now and enjoy the recipes that first made him a superstar. This recipe for Pan-fried Fillet of Cod with Parsley, Capers and Brown Butter feels absolutely typical of everything I love about Jamie. It's simple to throw together, impossible to mess up and tastes totally sensational. 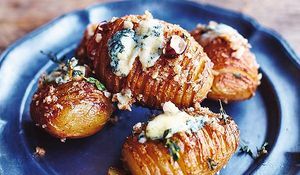 I served mine with a simple green salad and oven chips, for minimum fuss on a weeknight, but it could be jazzed up with all manner of side dishes to make a perfect dinner party main course. It'll join the many other Jamie recipes on heavy rotation in my kitchen. Congratulations on 20 amazing years, Jamie, and here's to the next 20! What I thought: As the combination of peas and mint is already a firm favourite of mine, I already knew I was onto a winner with this recipe. The fresh and bright combination of the legumes with the mint and creamy parmesan sauce sounded like heaven, hitting that sweet spot of being satisfying without being too heavy – essentially it sounded like excellent Spring comfort food. As I was making this during the week, to save time I decided to substitute making my own tagliatelle for the shop-bought fresh egg variety, although the pasta instructions did look really straight-forward and easy to follow. I had a slight set back at my local supermarket where I had to switch in edamame for broad beans, but aside from that sourcing everything went without a hitch. The preparation was also super easy and also far more fun than I’d expect for an ordinary Wednesday night’s meal prep. As one of my flatmates had just moved out, taking most of the (admittedly hers) kitchen equipment with her, I had to take Jamie’s instruction to ‘smash’ the veg quite literally, with the aid of a sandwich bag and my own fair hand. There’s something rather therapeutic about being able to squish your food into a pulp without being judged – it is a ‘culinary technique’ after all guys. As I was only cooking for two (not four as the recipe caters for), I halved the pasta but kept the same amount of sauce – I like a high sauce to pasta ratio, especially when the flavours are as good as these! Cooking time was around 10/15 minutes once you factored in blanching the peas/beans, but I still had to deal with my friend coming into the kitchen with a spoon every minute or so to ‘check on the food’ as the whole flat smelt incredible. Once the sauce was made, you tip the al dente tagliatelle in and give it a quick stir. Plate it up and add a liberal sprinkling of parmesan (and even more liberal application of black pepper) and you’re done! I served ours with a rocket and cherry tomato salad to help cut through the richness, although this really wasn’t necessary as although the sauce was lovely and creamy, it wasn’t too rich at all. All in all, including prep and cooking time, this took less than 25 minutes. 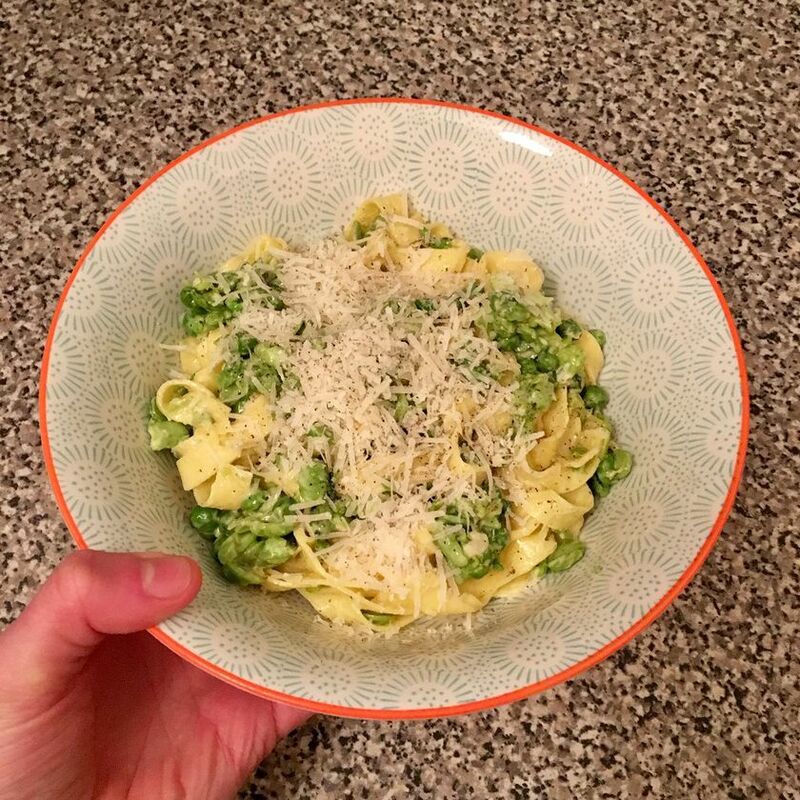 Obviously if you’re making your own pasta this would be slightly longer, but as it was this recipe was a great tasting dish for a quick yet satisfying weekday night meal. I will say that there was quite a lot of pasta, and although I halved the recipe I still had enough for lunch the next day (albeit bulked up with salad). 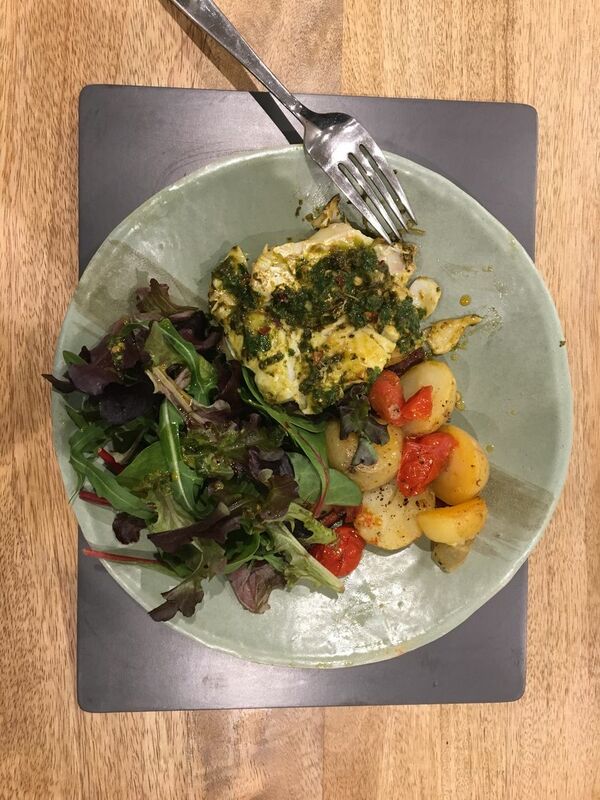 What I thought: I was immediately drawn to Jamie’s Seared Tuna Steak with Fresh Coriander and Basil, as I love a fresh salsa verde over fish! Unfortunately, it being a week night and limited to a Tesco extra shop, I could not find any tuna steaks. But my local shop did have some lovely pieces of cod, so I substituted the tuna, and served the fish alongside a green salad drizzled with some of the zingy sauce, and some new potatoes roasted with chorizo and cherry tomatoes. 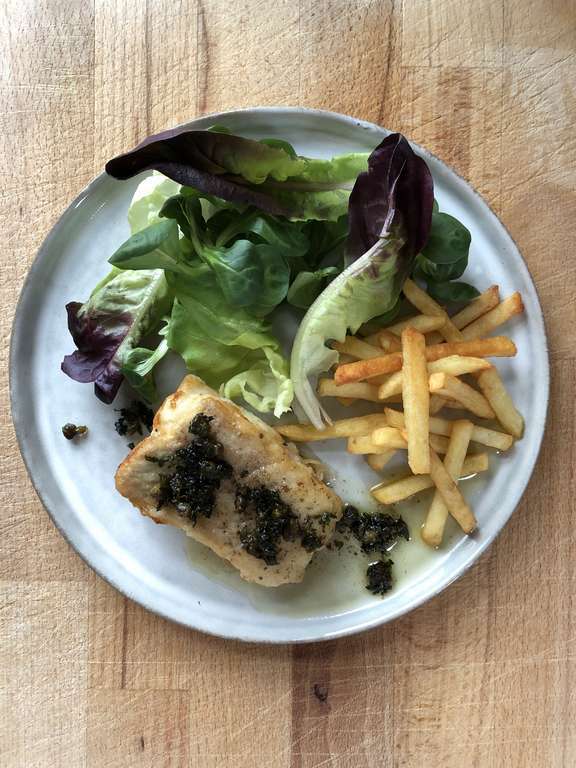 It was really easy to make – while my potatoes cooked, I made the sauce and prepared the fish. 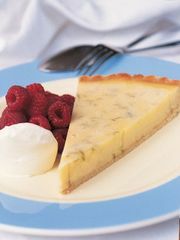 This will be a new mid-week staple in our household, it was delicious!